I always put off the task of seeding the passion fruit and guava to get the juice, because it is so time consuming. No more will I put of until tomorrow what I can do today. 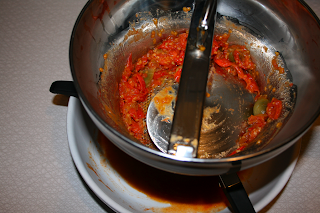 I heard tell that a food mill was the secret to quickly seeding the fruit as well as seeding tomatoes for a perfect sauce... which I tried the other night. No more skinning and seeding. 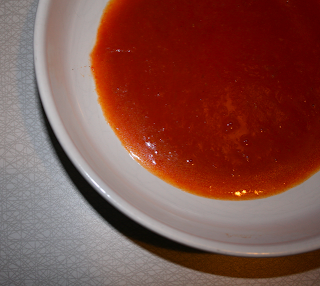 I simply sauteed the tomatoes in a little olive oil and salt until soft, then gave them a spin in the food mill for a perfect and delicious sauce. All I can say is YES! It takes a few minutes rather than 30 minutes to get juice/pulp and the clean up is so much easier then an mesh sieve. Just rinse and it's over. For those of you who do not know what a food mill is, it is a tool used to grind and purée foods through perforated disks using a hand-turned crank. Just fit one of three sieving discs (coarse, medium, or fine) into the open base of the bowl-shaped hopper. The food is forced through the sieve by a spring-loaded, semi-circular blade of tinned or stainless steel, which is clipped in place to press down hard on the sieve. This disc revolves on the surface of the sieve as the central crank is rotated. John's mom knew we were in the market for one and brought us this OXO Food Mill from New York as an early Christmas present. Our next kitchen toy... an ice cream maker. Your post gave me 'purge anxiety'. 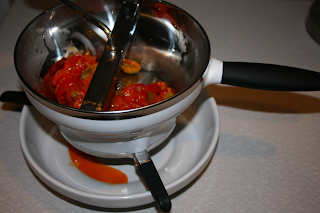 Back in the 1970's, I had a hand-crank Foley Food Mill, which I used not too often. Now I regret that purge. BTW, your sauce looks divinely smmmmmmoooooooooooth.